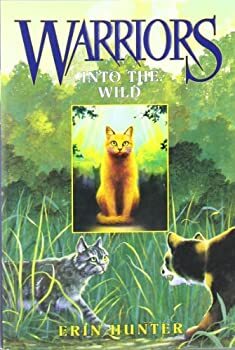 Erin Hunter is a pseudonym used by four women: Cherith Baldry, Tui T. Sutherland, Kate Cary, and Victoria Holmes. Here’s the Warriors website. Warriors — (Began in 2003) Ages 9-12. Manga editions are also available. Warriors — (2003-2004) Publisher: Fire alone can save our clan… For generations, four Clans of wild cats have shared the forest according to the laws laid down by their warrior ancestors. But the ThunderClan cats are in grave danger, and the sinister ShadowClan grows stronger every day. Noble warriors are dying — and some deaths are more mysterious than others. In the midst of this turmoil appears an ordinary house cat named Rusty… who may turn out to be the bravest warrior of them all. Warriors: The New Prophecy — (2005-2007) Publisher: Darkness, air, water, and sky will come together… The wild cats of the forest have lived in peace and harmony for many moons — but a doom that will change everything is coming. Strange messages from their warrior ancestors speak of terrifying new prophecies, danger, and a mysterious destiny. All the signs point to young warrior Brambleclaw as the cat with the fate of the forest in his paws. But why would the son of wicked cat Tigerstar be chosen to be a hero? And who are the other cats mentioned in the prophecy? All Brambleclaw knows for sure is that the strength and courage of the greatest warriors will be needed now, as the quest to save the Clans begins… and shake the forest to its roots. Warriors: Power of Three — (2007-2008) Publisher: There will be three, kin of your kin… The wild cats have flourished in their new home on the banks of the lake for several seasons, and the Clans are growing strong and healthy with new kits. The time has come for three kits of ThunderClan to become apprentices. Hollypaw, Jaypaw, and Lionpaw spring from a strong legacy: children of Squirrelflight and Brambleclaw, two of the noblest ThunderClan warriors, and grandchildren of the great leader Firestar himself. All three young cats possess unusual power and talent and seem certain to provide strength to the Clan for the next generation. But there are dark secrets around the three, and a mysterious prophecy hints at trouble to come. An undercurrent of rage is rising against those who are not Clanborn, and the warrior code is in danger of being washed away by a river of blood. All the young cats’ strength will be needed if the Clans are to survive… who hold the power of the stars in their paws. Warriors: Omen of the Stars — (2009-2012) Publisher: After the sharp-eyed jay and the roaring lion, peace will come… Four warrior Clans have shared the land around the lake as equals for many moons. But a prophecy foretells that three ThunderClan cats will hold the power of the stars in their paws. Jayfeather and Lionblaze know that they are two of the cats in the prophecy. Now the brothers must wait for a sign from StarClan to discover the identity of the third cat. Meanwhile, Dovekit and Ivykit — kin of the great leader Firestar — are poised to become ThunderClan apprentices. Soon one sister will have an ominous dream — and will begin to realize that she possesses mystical skills unmatched by any other cat. In the midst of a cruel season that threatens the lives of all four warrior Clans, bonds will be forged, promises made, and three young cats will start to unravel the secrets that bind them together. FIND MOST RECENT WARRIORS NOVELS AT THE WARRIORS WEBSITE. FIND THE MOST RECENT SEEKERS NOVELS AT THE SEEKERS WEBSITE. FIND THE SURVIVORS SERIES AND OTHER BOOKS BY ERIN HUNTER AT THE ERIN HUNTER WEBSITE.